Engaging Baudrillard has just updated their web site to reflect the stellar list of guests, including Mike Gane, Mark Poster and Douglas Kellner. To be held next September in Swansea, Wales, this conference promises to expand notions of the object, reversability and mediation. In other words it will completely screw with one's head. I'm looking forward to it, especially as I myself will be delivering a paper on the most recent Dr. Who series. My contribution will be part of the Science Fiction Studies panel, chaired by Alan N. Shapiro. 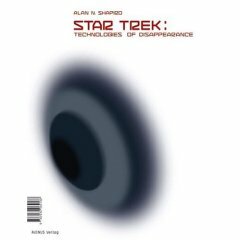 His recently book Star Trek: Technologies of Disappearance, published by Verlag Avinus, has been favourably reviewed in the International Journal of Baudrillard Studies and less positively at The Pantaneto Forum. Writing in Science Fiction Studies, Istvan Csicsery-Ronay Jr. called it "immensely valuable contribution to sf-theory". For a taste of the contents you can read this paper, which has links to a couple more. When we met last summer Shapiro and I found an unusual affinity, in that we were both programmers fascinated by Baudrillard and Virilio and also fluent with Star Trek and other SF media productions. If your interests collide in similar fashion you may wish to be in Wales this coming September. The location is particularly suited to my needs, as it is BBC Wales which is producing Dr. Who as you can tell by this intriguing page of Wales/Who connections.